Jodi Stemler Consulting worked with the Virginia Department of Game and Inland Fisheries’ Bureau of Wildlife to write their 10-year work plan for their Quail and Early-Successional Species Recovery Initiative. 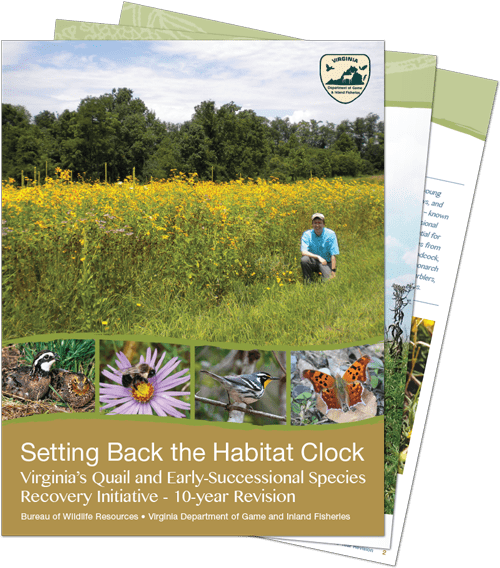 Setting Back the Habitat Clock outlines the importance of these early-successional habitats, outlines what VDGIF and their partners have done for quail recovery and habitat work, and lays out their plan for the program over the next decade. The writing and design were important to the client because not only did the report have to outline their plans for the future, but it also needed to be compelling enough to encourage new landowners and partners to participate in the projects across the state.